And you’re RIGHT. You do get the job done. And no doubt, you get the job done very well. Because technically, you’re great at what you do. But there comes a point in most people’s careers where they are asked to (and want to) step it up a notch. You might be thinking about the next promotion, or moving into a role where you’re going to be challenged with new aspects of the job you’ve never done before. Maybe it’s growing or managing a team. Maybe it’s growing or managing a client base. Maybe it’s growing and managing YOU. And that’s when you need to shift focus from being the “doer” to being the “leader”. Fiona has inspired, coached and mentored thousands of professional women to move beyond the technical and embrace the traits and behaviour of leadership, helping them step up to the next level of their career. This topic is ideal for any woman who knows they want to progress and be the best they can be in their career – for themselves AND for others around them. Fiona is a full of life Scottish-Aussie and former Corporate lawyer who thrives on connecting people in business and inspiring women to build brilliance in their career and life. Featured in the SMH, Women’s Fitness, Smart Company, Marie Claire, Women’s Agenda and The Huffington Post, Fiona is a professional speaker, trainer and coach with expertise in helping professionals build strong communication, influencing and networking skills to enhance their career success. 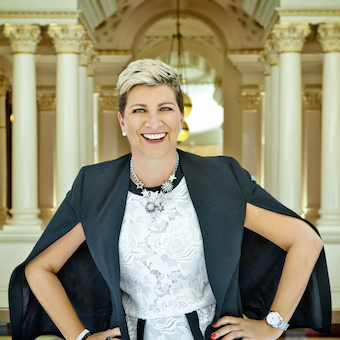 Having moved to Australia knowing no-one, she has built a thriving and valuable network from scratch in 3 states and 2 years ago founded SmartWomen Connect, which is fast becoming the go-to networking and professional development group for career women in Australia.